Vision Creative Conference is an annual event that brings together pioneers from the creative industries and showcases their innovative thinking. With a range of speakers from Google employees to founders of Iced Coffee brands, a few Wildlife Filmmaking students excitedly headed down to the Arnolfini to see what it was all about. Joining some of the Documentaries and Features students, we went to make a promotional video that demonstrated the “creative freedom” theme of the conference, and we intended to absorb as much creativity as we could from the speakers. Kicking off the conference was Alex Hunter, formerly of the Virgin Group, who told his audience how companies should use social media to create personal relationships with customers: wise words for a digital age. But it wasn’t all about marketing. Jon Fidler is the founder of 3D printing design company Modla, and he explained his vision for using 3D printing to connect children with nature – it costs around £3 for the materials to 3D print the casing for a camera trap, a tiny investment for a young person to learn a valuable lesson about how technology can be used as a conservation tool. Perhaps the most interesting talk for a Wildlife Filmmaking student however, was a talk from Jonathon Wise, co-founder of Comms Lab, an organisation that works with communications agencies to articulate their positive role in society. His talk raised the point that anyone who produces content for broadcast has a responsibility for the effect their content has on society, and that advertising agencies should be held accountable for promoting mass consumerism in an age when the planet’s resources are dwindling. He envisaged a society where content producers were motivated first and foremost by the positive changes they could make to the way people think, and that – for me at least – was the real vision of the conference. This entry was posted in Blog and tagged 3D printing, Alex Hunter, Arnolfini, creative industries, Iced Coffee, Jon Fidler, Vision, Vision conference, wildlife filmmaking. 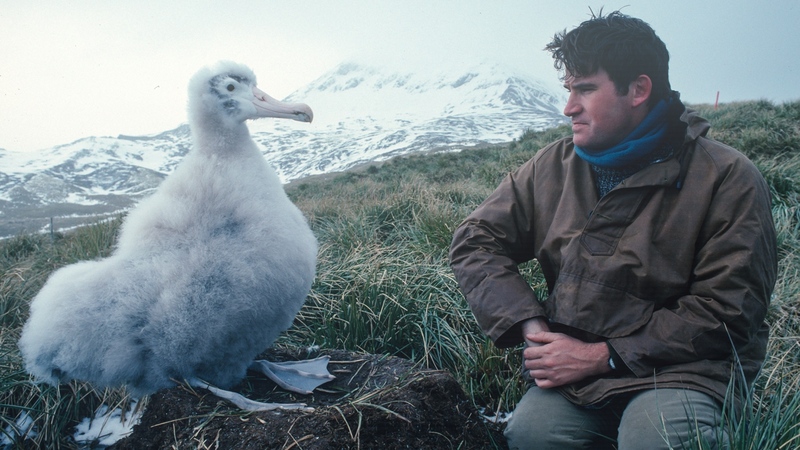 Alastair Fothergill has produced some of the best natural history films to come out of the BBC, and in the last decade has emerged one of the genre’s most prominent pioneers. On Thursday, he gave a talk about some of his finest films in aid of the Starfish Pool Appeal, a campaign to raise money for a hydrotherapy pool for children with disabilities at Claremont Secondary School. A presentation of both footage and the stories behind the making of the biggest landmark series’ produced by Fothergill, the evening was entertaining for everyone in attendance, from families to filmmakers. Introduced as a “true legend in Natural History film making”, Fothergill began the evening by sharing some of his early career aspirations, explaining that he wanted to make natural history films to paint a portrait of our planet, and the complex animals, plants, and landscapes that make it so beautiful. Before Blue Planet, there hadn’t been many films made about the oceans, and with footage such as that of the deep ocean viewers were shown new landscapes and behaviours they’d never seen before. Five years later, Planet Earth was a series of portraits of different habitats, and viewers were blown away by sequences such as that of the snow leopard; the first time the animal had been caught on camera. Equally as enthralling is the story behind the camera – sharing the area of the Karakorum mountain range with US soldiers looking for Osama Bin Laden, the cameramen had to wait a year for the area to be cleared. Fothergill admitted that he owes much of the success of Planet Earth to the technology: new gadgets like the gimbal-stabilised helicopter rig allowed for complete sequences to be filmed from the air for the first time. New camera technology that allowed cameras to work in extreme cold conditions meant that filming for Frozen Planet could continue throughout the year, allowing the story of the seasons at the poles to be told. Despite this however someone still had to be there to operate those cameras, and Fothergill told stories of cameramen floating away on ice sheets, and even recording messages for their wives in case they didn’t survive one particularly bad blizzard. The end of the talk brought a range of questions from the audience, and we learned that Fothergill’s favourite animal is a chimpanzee, and his favourite place is South Georgia, despite the cold. He also told of his frustration that such big spectacles that he sees when on location are often not done justice being shown on small screens, something which has recently caused him to move into feature films for Disneynature. His desire to reach a large audience however has brought him back to television, as he believes it is important to inspire the younger generation to connect with and respect the natural world. And if he keeps making films like he showed on Thursday, I do believe he will continue to do so. This entry was posted in Blog and tagged Alastair Fothergill, BBC, Blue Planet, Bristol, Chimpanzee, Claremont Secondary School, Disneynature, Frozen Planet, Planet Earth, South Georgia, Starfish, wildlife filmmaking. So the day I’d been waiting for all summer finally arrived, and I have now begun the MA Wildlife Filmmaking course at UWE. It’s only been 10 days and it’s already pretty exciting! Since then we’ve mostly been spending our time learning the fundamentals of filmmaking and getting to grips with the kit we’ll be using to make our films. 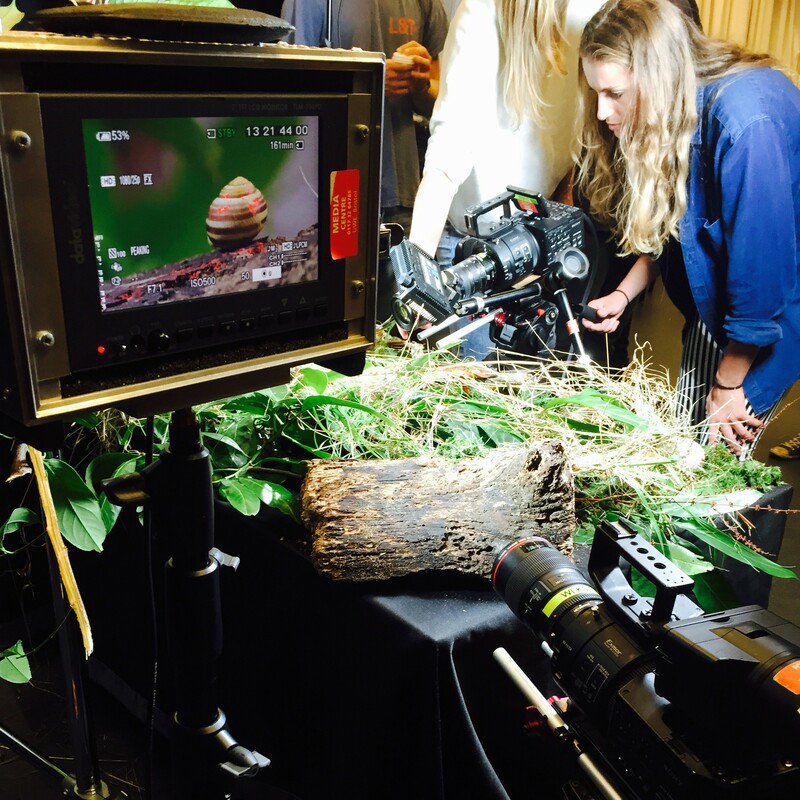 We’ve had workshops on the Sony FS700, sound recording, and today we learned a bit about telephoto and macro lenses – filming some creepy crawlies in a set we’d built in a studio. 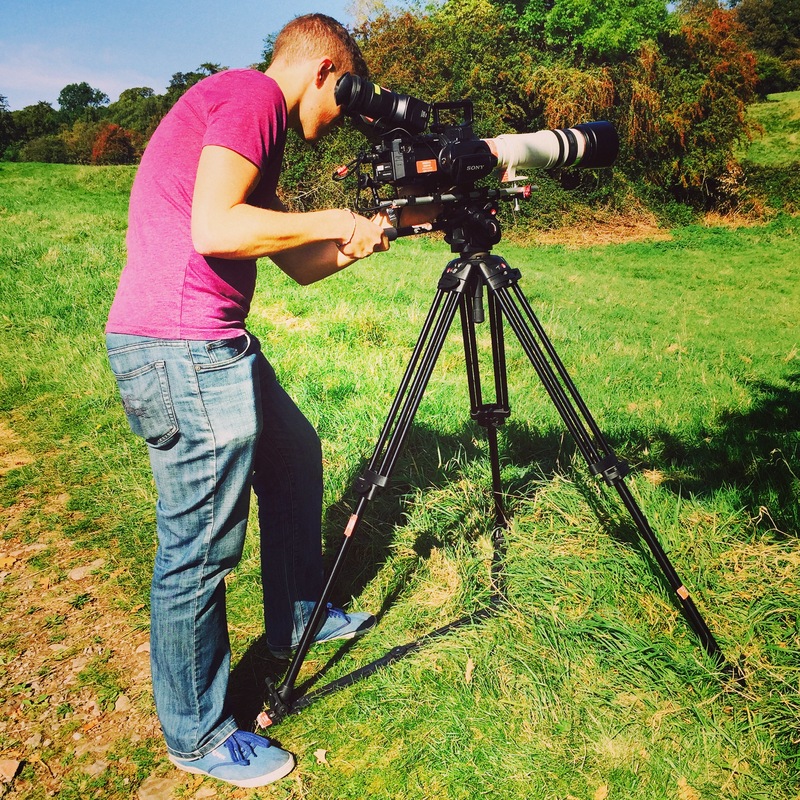 Now that we’ve learnt the basics of our kit, we’re allowed to take it out on our own to do some filming, so watch this space to see some footage of wildlife shot by yours truly, very soon! This entry was posted in Blog and tagged BBC, cameras, macro, NHU, postgraduate, Sony FS700, university, wildlife filmmaking. A couple of weeks ago I was lucky to go to an event ran by Bristol Festival of Nature called “Made in Bristol: The Story of Wildlife Film’s Tinseltown”, celebrating the huge success of the wildlife film industry in Bristol. The evening invited Mike Gunton (executive producer of Africa) and Keith Scholey (director of Disneynature’s African Cats) to talk to Brian Leith (Human Planet, Wild China) about why Bristol is the “Hollywood” of wildlife film, and how you go about making a blockbuster. The evening began with a brief introduction by Brian Leith about how Bristol has changed since he first started working there. He talked about the fact that without the BBC NHU the wildlife film industry wouldn’t be where it is today, and how Bristol too owes a great deal to the presence of the unit there. He then moved on to talk about some of the groundbreaking series and films that have been made in the city, and how the success of those films has brought the attention of Hollywood, in the form of Disneynature. I was hoping he might talk briefly about the new Disneynature film he’s part of (Born in China), or even about the human/animal interaction focused films that he makes; unfortunately his role for the evening remained as a host, nothing more. On to the first presentation, by Mike Gunton. As the creative director of the NHU, he had a lot of stories from across the years he’s worked there getting to where he is now. One particular story involved how (in his words) he “nearly killed” David Attenborough by asking him to present a piece to camera underground in the heart of a termite mount (watch it here) in Nigeria for Trials of Life, which apparently he did while being bitten by hundreds of angry termites. He also talked a bit about the trials of making Frozen Planet, and how some of the filming firsts also contributed to science – the brinicle formation sequence (here), for example, has helped scientists understand such a weird phenomenon and see what it looks like without having to hang out in freezing temperatures underwater. While stories are great, what I really came for was insight into the process of transforming an idea into a great film, and Keith Scholey duly provided for in that respect. He talked a lot about the different stages of making African Cats, from selling the idea to Disney without a script, to how to film a cheetah hunting at speeds all but impossible to follow while filming out of the side of a jeep. Apparently, the way to do it is to film in two parts – first you film the cheetah stalking its prey and approaching the point where it begins to sprint after it, then you have to drive around in a big loop to the rough location where the kill will be made, in time to see it happen. Quite frankly it baffles me how anyone could successfully judge the distance and direction that the cheetah would be likely to run, but knowing your subject and years of practice clearly allowed for Simon King and Sophie Darlington to get the shots that they needed. One of the highlights of the evening for me came in the questions at the end. Award-winning underwater cameraman Doug Allen asked a question which I always wonder, which is “Why don’t the BBC make more films with key natural world issues such as conservation and climate change as themes, especially given that the majority of the documentaries, particularly blue chip, portray the natural world as being pristine and perfect?”. Most of what was said in response was quite watery, in my opinion: a bit was said about the “issue focused” episodes that increasingly come at the end of blue chip documentaries (Frozen Planet, Africa for example), and Scholey made some comments along the lines of it not being the responsibility of the BBC and that audiences want to be entertained rather than preached to. I think he has a point about entertaining audiences – you only have to look at how many popular sensationalist wildlife programmes there are, in America in particular (there are a lot out there with “killer”, “monster”, or “dangerous” in the title), to see that what often sells is not good education. As far as responsibility goes however, I have to disagree. Leaving aside the fact that the BBC still operates as a public service and has a duty to educate, every filmmaker creating something for the BBC (or any other channel, on TV or through other mediums) that knows they will reach a wide audience has an opportunity to educate its viewers. In the same way that a musician has a responsibility for how they influence their fans, filmmakers have a responsibility for how they influence their viewers: reaching an audience provides an opportunity to provide people with information. If 7/8 episodes of a series show wildlife thriving and the natural world looking beautifully pristine, then people are likely to assume that that’s mostly how things are. For me it comes down to the fact that without the natural world, we wouldn’t be able to make films about it. You wouldn’t make a Hollywood blockbuster without paying the actors, so why don’t filmmakers in Bristol give something back to their stars by inspiring viewers to care about the environment or conservation? This entry was posted in Blog and tagged BBC, BBC NHU, Brian Leith, Bristol, Bristol Festival of Nature, David Attenborough, Keith Scholey, Mike Gunton, natural history, wildlife filmmaking.